Robust dining armchairs in a choice of sixteen faux leather colours and a solid wooden frame in a further choice of 14 finishes. Comes with a two year factory guarantee. 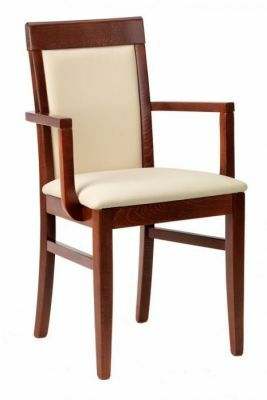 Upholstered seat and back dining chair, with strong all wood frame stained in a range of different finishes. Highly attractive design this range of seating is ideal for use in an upmarket professional restaurant atmosphere.